A short time ago, a reenactor asked about how to wear neckcloths as a sailor of the mid to late eighteenth century. I thought it was about time to put down my observations. These are partly lifted from my comments in the thread over at the Facebook group Rev War Reenactors, but greatly expanded with images and quotes from common sailors of the period. To start off, I should first define what garment we're talking about. I have thus far used the term 'neckcloth' for this blog because I thought that term was clear in precisely what it was referring to: a cloth worn about the neck by sailors. It turns out that sailors themselves did not refer to them as such. 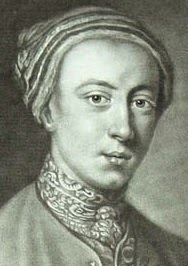 When she was Whipt on board, her Hands being lashed to the Gangway, she stood upright, and tied a Handkerchief round her Neck, to prevent, as it were, any Lashes that she might accidentally receive there, to conceal her Breasts, which were covered by the Ends of the Handkerchief falling over them, and thereby prevented a Discovery which must unavoidably have happened, had not she thus acted. They made me a number of stocks, which I always wore when I was on shore in the place of a handkerchief around my neck. All this time I was in the very midst of the flames; my shirt, and the handkerchief around my neck were burnt, and I was almost smothered in the smoke. In the morning when I awoke, the Governors barges cap that I wore was gone, my handkerchief off my neck, and what money I had about me was gone. Common sailors referred to these garments as handkerchief, or (in the case of one) a neck handkerchief. In the near future, I will be editing every post on this website to reflect this more accurate terminology. For more on neckwear, the vocabulary surrounding it, and how it was used, be sure to check out Ruth Hodges' presentation from earlier this year. I am indebted to Ruth for help on this post. Photo from General Carleton Shipwreck, page 193. It is also helpful to note that common sailors appear to have worn their neckwear differently from masters and naval officers. Officers usually wore neckstocks that were carefully tied and tucked into their waistcoats. 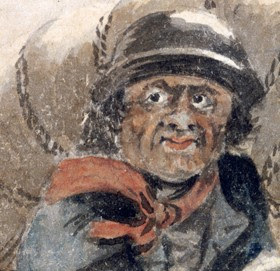 In the case of Captain Wilkinson's portrait, where an officer affects the dress of a common sailor, his handkerchief is tied and tucked in a fashion far more becoming an officer and a gentleman than Jack Tar or Tom Pipes. 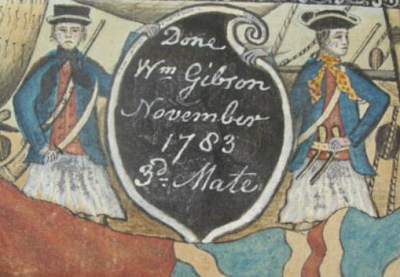 Detail from Captain Andrew Wilkinson, Gabriel Mathias, 1755, Mariners' Museum. Common sailors generally wore the handkerchief over their shirt collar and outer garments. 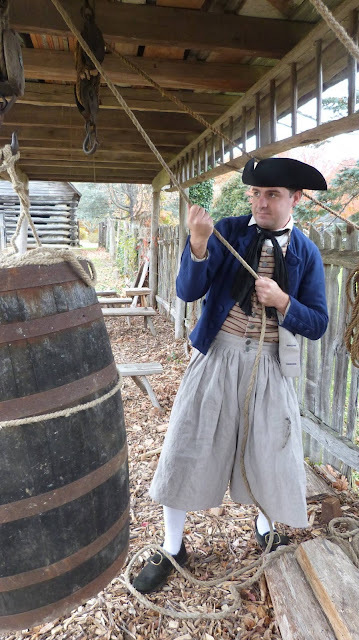 There is a tendency among sailor-reenactors/living historians to tuck the neckcloth under the collar like a modern necktie, an error I myself have committed. To be sure, some sailors did wear their handkerchiefs as such, but the majority of primary source images contradict this. The detail below shows the handkerchief clearly being worn over the outer jacket. Library for the Decorative Arts and Material Culture. 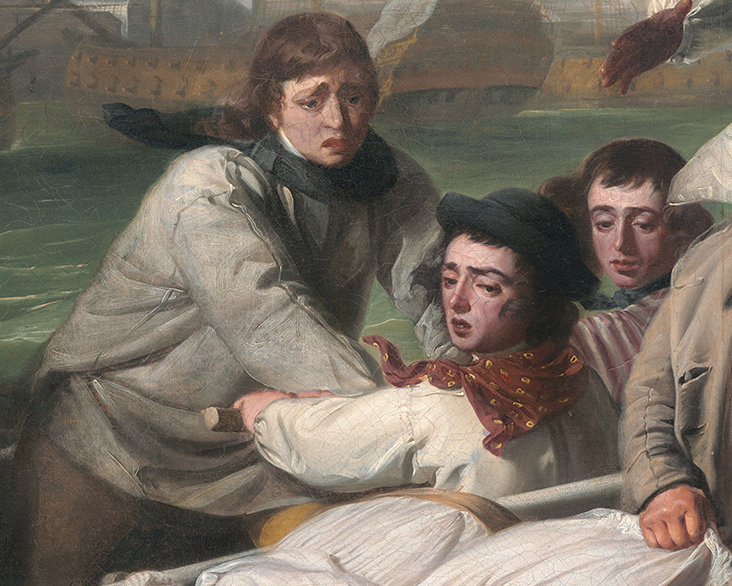 In this detail from George Carter's Death of Captain Cook, you can also see the handkerchief being worn over the sleeved waistcoat of the sailor climbing into the boat. The sailor on the right does have his collar peeking above the handkerchief, which is tied just a few inches from the base of his neck. Detail from Death of Captain James Cook, George Carter, 1783, National Library of Australia. 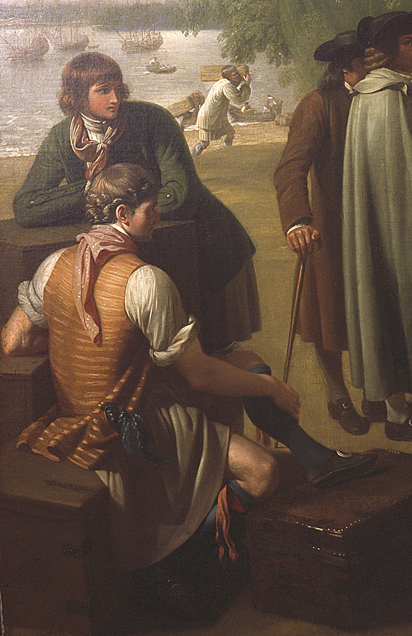 In this detail from Benjamin West's painting, you can see that the neckcloth is worn over the outer garments. 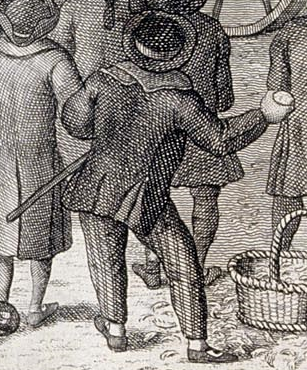 The sailor in the back wears his a bit loose, but tied in a different knot than the fellow in Death of Captain Cook. Pennsylvania Academy of Fine Art via With Art Philadelphia. 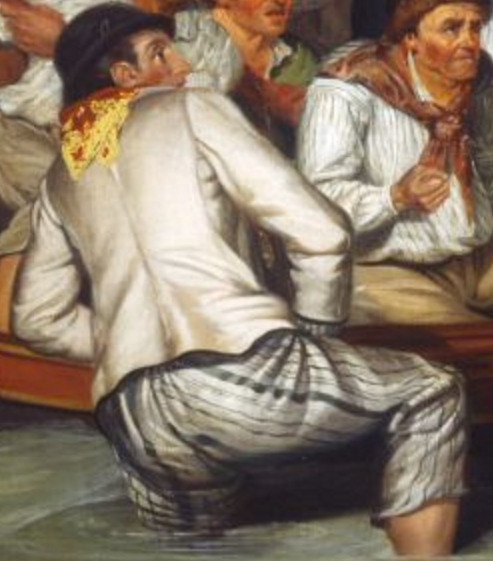 In Copley's Watson and the Shark, the standing sailor helping row the oar wears his handkerchief close around the neck, but once again over his outer garments with only a hint of the collar beneath. As to knotting the handkerchief, you can't really do it wrong. You can see a variety of knots in the images above, but it's easiest to just do a square knot. That appears to be how it is tied in the cartoon below. The distance of the knot from the throat does appear to change over time. 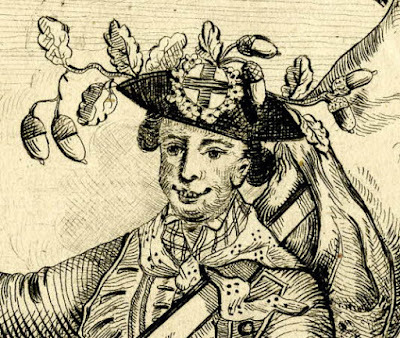 From the 1740's through the 1760's, the handkerchief was worn close around the neck in virtually every print and painting in which a handkerchief can be seen. Library, Harvard University via Capitu Tumblr. 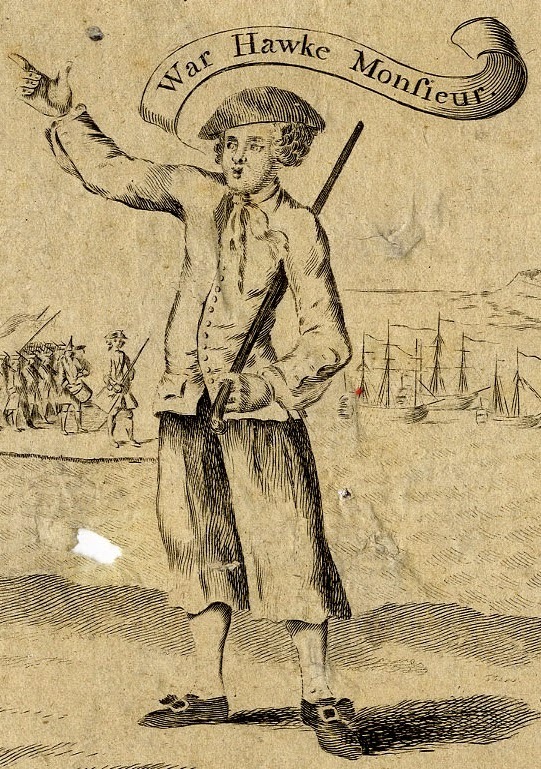 It is only in the 1770's that handerkchiefs start to loosen around the necks of sailors in art. It is quite possible that it began in the 1760's, but if this is the case, I've not yet found any evidence of it. With that said, through 1790, the handkerchief is either closely tied or hanging just a few inches below the neck. 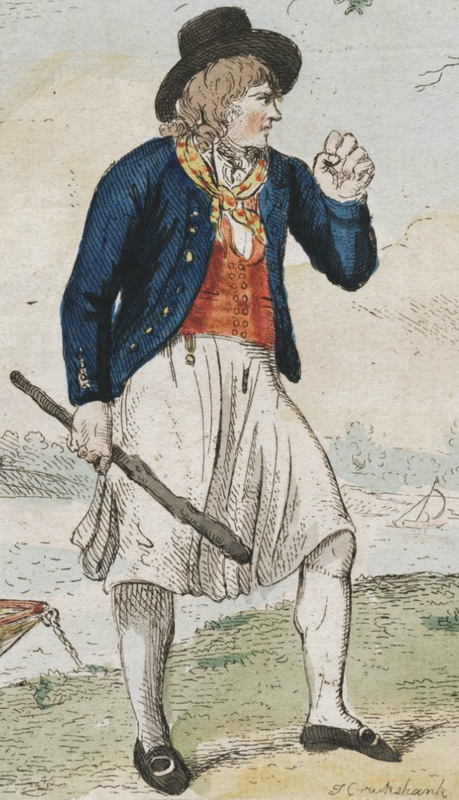 By 1790, most images still show handkerchiefs being worn close by sailors, but a few hint at the trend in the early nineteenth century (as pointed out by my brother blogger over at Napoleonic Tars) to wear the handkerchief very low indeed. As I have said before, we must be aware of a very real possibility of artistic bias. Most artists whose works I have featured on this website were not sailors. 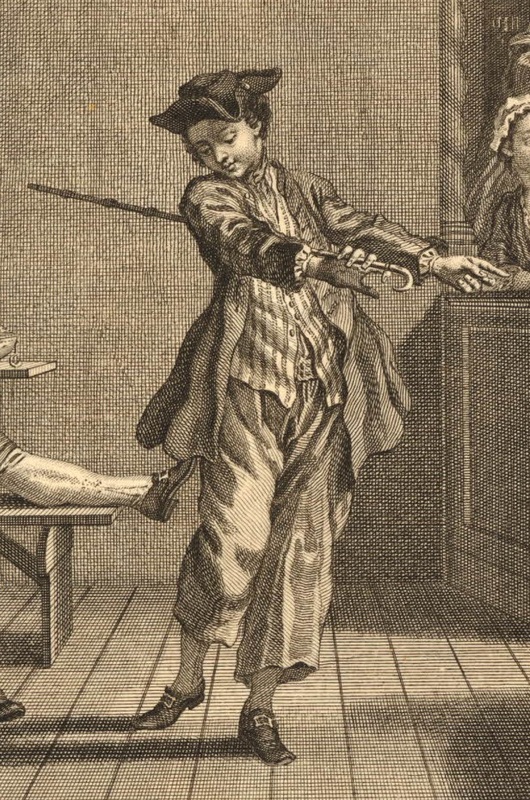 As such, it is quite likely that most sailors we see depicted are representative of what the artist thought they should look like, rather than what they actually wore. Very few sailor artists exist, and we cannot take the few images of theirs which clearly show a sailor wearing a handkerchief as being representative of the nameless thousands who formed the British and American ships that populated the Atlantic world. Even so, we can draw broad generalizations from the hundreds of images that depict sailors in the mid to late eighteenth century. Thanks so much for adding to our knowledge of 18th century handkerchiefs, Kyle! For my work on British maritime clothing of 1680-1740, handkerchiefs were worn "close around the neck" in the same way as your 1740-1770 images demonstrate. Also, as you point out, this is the issue of artistic bias. 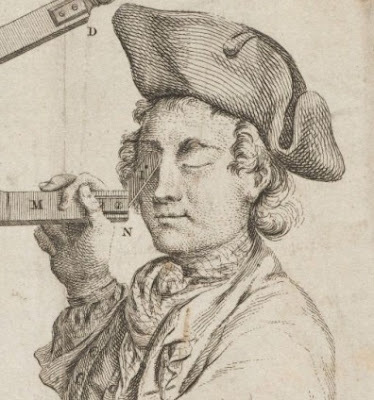 While I'm still analyzing my data, I'm starting to find that not every sailor wore a handkerchief. The images I've collected and the documents I have are at least suggesting that a little. But is it because they didn't want to, didn't have one, or some other reason? I am still taking my time thinking on that. Well done Kyle! It is great that you have made the distinctions of various ways of wearing the handkerchief and noting the difference from earlier in the century to later!